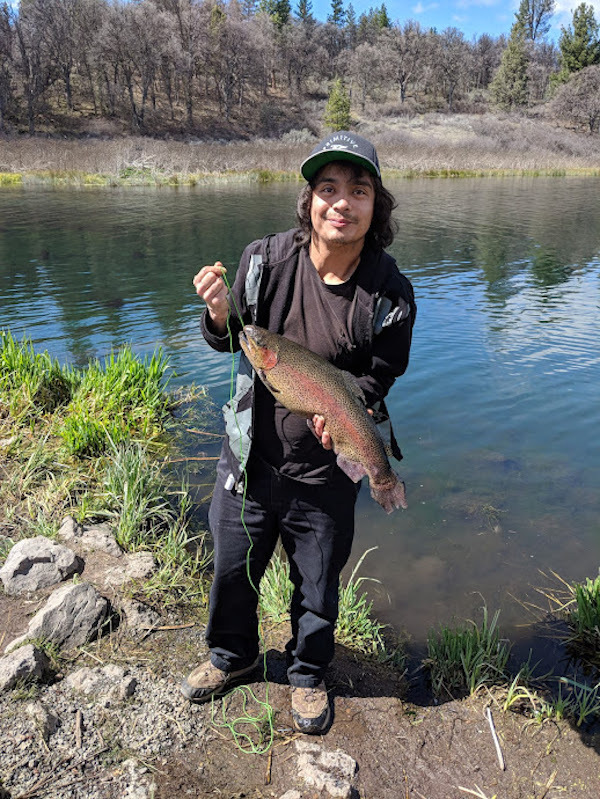 Angel Galvez with a big brood stock rainbow. Most everything in the Hat Creek / Burney area is gearing towards the traditional trout season opening on the last Saturday of the month. Even though Baum Lake is open year round there tends to be a lull in fishing this time of year as stocking the lake during March and early April is held back. There is a big infusion of trout planted along with the rest of the area creeks and streams just prior to the opener. Stopping by Burney Sporting Goods in Burney for the latest information, the report from Jim was for modest fishing with many using flies such as Midges, Copper Johns, PMD's along with green, brown and purple wooly buggers. The wooly bugger is a good choice for spinning anglers using a bubble fly combo. As I was getting ready to toss a few spinners myself, I was speaking with Angel Galvez of Burney who was also making note of the slow day. Before I could make my first cast Angel finally hooked into his first fish of the day using a yellow Panther Martin with black dots and it turned out to be his only fish. That fish proved to be a true trophy an eight plus pound beast of a brood stock rainbow. It goes to show that even when fishing is slow there is that chance to hook a trophy. You just never know. As for my fishing day, did I mention it was a beautiful bright sunny day with eagles and ospreys flying overhead with a pair fighting in the air over a trout dinner. The views were beautiful, people were nice and so on....... I always do say that there is more to the fishing experience sometimes than actually catching fish. Maybe it will be my turn next time. Gary Heffley has been a valued contributor to MyOutdoorBuddy for over 10 years serving as manager, sales representative and reporter for much of Northern California. He is an avid outdoorsman and loves to fish and write about his adventures. He has a long history in the Sporting Goods field and uses that extensive experience to impart his wisdom in his writing.